Utilizes late model alternator an A/C bracket mounting provisions. Has additional vacuum tap off of runner. Recommended intake manifold gasket - Mr Gasket #'s 5821 or 101G Plenum depth: From the carb flange to the bottom of the upper plenum is 2-3/16”. To the bottom of the lower plenum is 4-1/16”. The Weiand Speed Warrior features long, separated runners for bottom-end and mid-range power, plus a special runner design and larger plenum to flow the air needed for high-rpm horsepower. All of this usable power makes this intake perfect for your street and strip hot rod! 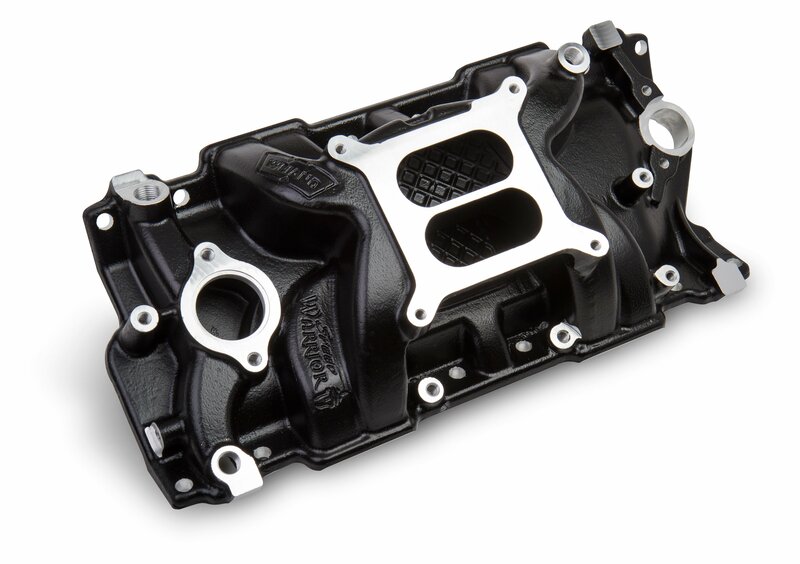 Weiand developed the first ever aluminum intake manifold in 1937. Thirty years later Weiand developed complete blower drives for the GMC 6–71 supercharger. Today, Weiand is still at the forefront of intake manifold and blower development as well as high flow water pumps. To make more power you have to get more air to your engine. Look to Weiand as your power source! Height: Front 4.19", Rear 5.27"